Share your family favorite Dutch oven recipes with a crowd using this one-of-a-kind cast iron piece. This Camp Chef 12-quart, 16 inch Dutch oven has a grizzly bear etched into the lid and bear paw indentation so it makes for a great addition to any outdoorsman's cast iron collection. Share your family favorite Dutch oven recipes with a crowd using this one-of-a-kind cast iron piece. 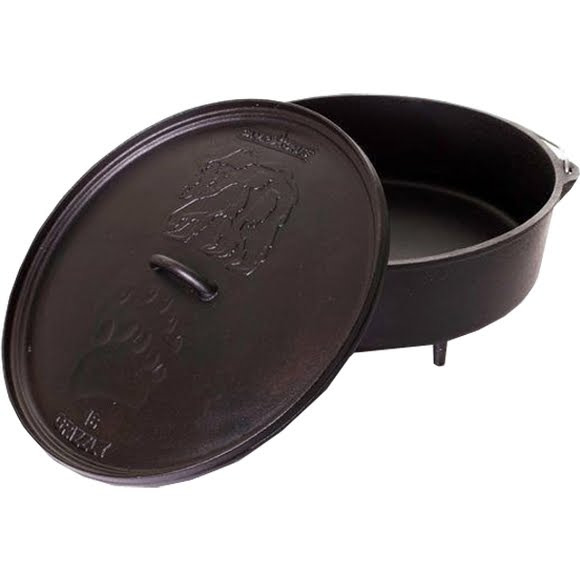 This Camp Chef 12-quart, 16 inch Dutch oven has a grizzly bear etched into the lid and bear paw indentation so it makes for a great addition to any outdoorsman&apos;s cast iron collection. This classic Dutch oven comes pre-seasoned with Camp Chef&apos;s true seasoned finish providing a natural, easy-release surface that is ready to cook on out of the box. Dimensions (packed) Inside Diameter: 15 3/4"